Following an “executive session” closed to the public, the Albany City Council has softened a couple of tough new laws aimed at vagrants camping on public property. In March the council passed laws banning unauthorized camping on public property and establishing an “exclusion zone” from which people could be banned for up to a year if they had been convicted of various offenses, including overnight camping, three times over six months. Last week, though, a panel of the Ninth Circuit Court of Appeals ruled that an Idaho city’s penalties for sleeping on public property amounted to cruel and unusual punishment and were therefore unconstitutional. The decision affects all western states in the Ninth Circuit unless and until it is appealed and overturned. Albany City Attorney Sean Kidd told the council Wednesday that Albany could comply with the ruling by reducing the camping offense in its new anti-vagrancy statutes from misdemeanors to mere violations. Misdemeanors can carry stiff fines and even jail terms. For violations, the maximum fine is $100, and usually it’s much less. Presumably then, the penalty for sleeping in a park or on the sidewalk can no longer be deemed cruel and unusual. The exclusion ordinance was most controversial and passed over the strong objections of advocates for the homeless. Since it took effect in March, no one has actually been excluded but the city attorney said he’s getting ready to file three cases seeking exclusion orders with the municipal court. The council acted to amend both ordinances after coming out of an executive session from which the public, as usual, was barred. Two reporters (Jennifer Moody of the Democrat-Herald and I) sat in under ground rules prohibiting reporting on the substance of the discussion. The brutish bullies occupying the City Council, heavy-handed thugs who believe their principle duty is to protect downtown Albany business interests, is about to get spanked. Like Trump, the Mayor and a few of the more un-American councilors believe only pleasantly dressed, sufficiently bathed persons should be allowed to mingle amongst the Albany glitterati. And the City Attorney, who knew full well this anti-camping statute was unconstitutional, went along with the vulgarity anyway. Thankfully, we still live in a democracy, where, in spite of the Reactionaries in City Hall, folks can still do business in the sacrosanct corridors of downtown Albany whether you like their appearance or their smell. The Council’s statute, giving tickets to persons the Chamber of Commerce types don’t like simply because these citizens don’t fit the CARA image, is about to be trashed in a lawsuit the City cannot win. If we continue to allow the Council forge these discriminatory laws, the next thing will be another Kristallnacht, with barb wire fences to keep the homeless at bay while squads of neo-Nazis purge the poor from downtown streets. And that is why the Council went into Closed Session…because they’ve been caught trying to govern for the wealthy instead of for ALL citizens. Maybe the barbed wire along the canal was installed for this purpose because otherwise, the wire makes no sense. So..after spending millions to “brighten” up the down town we good citizens will have to put up with ne’er-do-wells lounging on the downtown benches! Say….open up the City Hall council chambers to overnight camping! Or maybe our police could round up them scoundrels and drop a few each off at the mayors & councilors homes. Perhaps the City should have considered doing something effective about homeless people instead of spending “millions” to spruce-up the decaying downtown CARA realm. Instead, the City seems content to limit people’s rights. Albany residents, like residents of all American communities, do not have the right to limit the movement of those they find objectionable, with the exception of convicted criminals. The Albany City Council and it’s cohort in despotism, CARA, would rather limit the freedoms guaranteed by our Constitution than try to do something about homelessness. Being homeless, or suffering from schizophrenia, or not having had a bath does not make one a “scoundrel” as some suggest. That someone who has lived a fortunate life would stoop to degrade a fellow human being, condemning them to living in sewer pipes and behind dumpsters, and threatening them with tickets merely for trying to survive, demonstrates how far out of touch that someone is. Hasso, you clearly feel the council violated at least the spirit of and likely also the letter of the executive session exception. Aside from you pointing that out here, are there other ways of holding the council accountable? Some kind of public complaint? Pointing out when the public is excluded without good reason is the best way to deal with this. It’s up to citizens and voters to let the council know if they don’t like something. The practice of holding executive sessions, then going back into public session to take a vote, means the public can’t see the vote either because the public by then has left. And in Albany’s case, video coverage ends when the closed session starts and does not resume when the meeting is reopened. Thanks, Hasso, for letting us know the ins and out of the council’s private sessions and their manipulating the TV sessions and their voting without the people being party to their discussions or how they voted, individually. The Court of Appeals got this one right. I was ashamed that our city passed the newer restrictive laws. While I am glad that Albany has softened its stance, even the $100 violation fine should not exist. Criminializing homelessness does not address the issue. Fining does not either. While I see and understand that trash, vandalism, hygiene, and crime issues also result from homelessness, this does morally allow us to criminalize just living homeless. Homelessness, to lesser and greater degrees, will always exist. The root causes of homeless are multiple and will continue to be with us for a long time — mental issues, addictions, health issues, low wage jobs, sky high housing costs. These result in homelessness for people of all ages and backgrounds. All should be treated by those of us more fortunate with honesty, compassion, and open eyes. Homelessness is larger than the economic ideas guiding socialist and capitalist frameworks. If one is a Christian, ask yourself, what would Christ do? How would He treat the homeless. If another religion, let your teachings and beliefs inform your actions here. If Athiest, consider what moral principals guide your treatment of other humans. I found it disturbing that Ward 3 City Councilor Kellum said at a public City Council session that, “I just think we’re caving too quickly,” when it became apparent that the Council was facing legal blowback on its efforts to curtail the free movement of legal citizens. I would refer Kellum and the other Councilors who think it prudent to discriminate against citizens to the City of Albany’s own charter which requires a sworn oath before a Councilor/Mayor takes office. Interestingly, the Charter says “each officer shall take an oath or shall affirm support of the constitution…”. Please remind me, but don’t the US and Oregon Constitutions include protections for even those who are homeless, or who suffer mental or physical disabilities. So when Kellum says, “…we’re caving too early,” does he mean that the less fortunate in Albany do not deserve due process? If Kellum’s attitude is reflective of Albany City government, then any oath of office he and the others may have uttered isn’t worth the paper it’s printed on. Equally disgusting is the Albany Democrat-Herald which used a photo of a homeless camper in Boise, Idaho at the top of their article outlining the alleged problem of homeless camping in Albany, thus supporting Kellum’s false bravado. The Democrat-Herald has proven itself useless and biased as a source for News. I am worried he is going to cost the city a ton of money from a big lawsuit, he seems like a bit of a loose cannon. With your impassioned plea about adhering to the existing law, I expect you to vote in favor of the sanctuary bill on the November ballot. 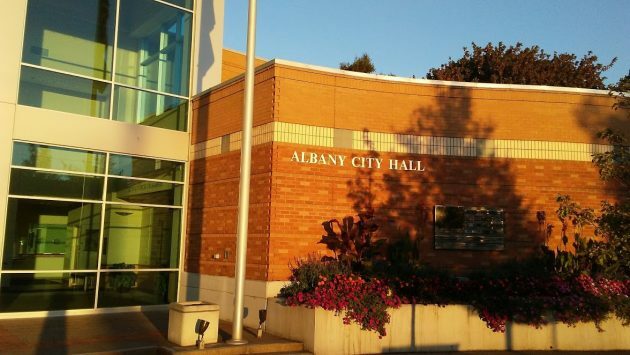 City of Albany is not saying you can’t sleep in public areas, for instance taking a nap on a public park bench during a picnic or sleeping outside to attend a black Friday sale or movie premier. The City of Albany is saying you can’t “homestead” public property. You can’t establish Fee Simple rights on public property. Once you set up your “home” on public land, more possessions than just required for basic sleeping, it’s no longer “camping”. The 8th amendment (cruel and unusual) should not be applied to penalties enforced for creating an illegal “homestead”. I agree, you shouldn’t introduce a religious components in order to qualify to stay at a shelter, as pointed out by the ninth, and I also agree if the only factor preventing you from entering a shelter is lack of capacity, then a public area should be put aside to sleep until a space becomes available to enter the shelter. If however other circumstances present themselves that exclude someone from entering a shelter, for instance illegal drug use, public drunkenness, the crime causing the person to not be allowed to enter the shelter should be prosecuted. If a crime is causing a person to have to sleep on public property, it is the crime that should be prosecuted, not the sleeping on public property.